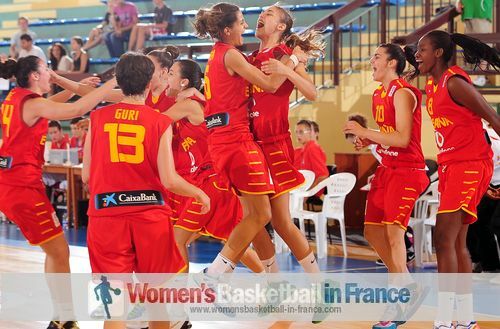 France and Spain have lived up to expectation at the 2013 European Championship for Women in Croatia. They have won all their games so far and have qualified for the gold medal game. At the bottom end of the tournament 2012 U18 Division B champions and runners-up, Belarus and England have been relegated. England battled hard against the Slovak Republic but still came out second best (57-70). The final margin of victory does not give England credit but at this stage of the competition only the victory counts. Eva Filickova was the leading scorer for the Slovak Republic with tidy 22 points. The Slovak Republic meet Croatia in the final relegation game. Croatia, the hosts picked themselves up from their overtime defeat against Portugal to beat Belarus (73-57). Croatia only pulled away in the game during the last six minutes with a 19-5 run to earn a last chance to avoid the drop. Inja Butina who is making a claim for a place in the all tournament team fired in 28 points for Croatia. France have been led by Clarince Djaldi-Tabdi and Marine Johannes who have been the big hitters for France in this tournament when the pressure has been on. 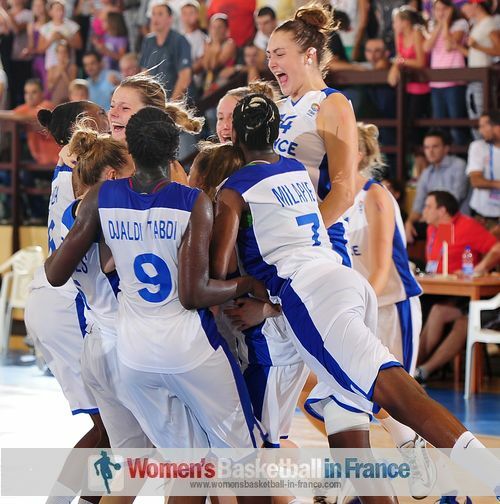 Both players contributed big plays to help France edge out Serbia (62-60) in the first semi-final. Johannes hit the shot that put France in the lead for good with 22 seconds to play while Djaldi-Tabdi picked up 10 rebounds. However the hero for France was Marie Mané whose 15 points proved to be decisive. Serbia were led by Dragana Stankovic (7 rebounds, 7 steals) who scored 21 points and the ever present Aleksandra Crvendakic who knocked down 14 points while picking up 10 rebounds. Stankovic was to foul out with 28 seconds to play. Unfortunately her replacement Branka Lukovic missed a pair of free throws with six seconds to play that may have won the game for Serbia. In the second semi-final Spain gave another master class in beating the Netherlands (80-41). Spain scored the first 8 points of the game and by the end of the first quarter led by 19 points (27-8). The Netherlands were blown away hitting just 12 shots from open play (26 points). The 15 points gained from the free-throw line brought some respectability to the final score line. Maria Arrojo and Leticia Romero filled the statistical sheets while leading the scoring 17 and 15 points each for Spain. You may watch the European Championship video highlights of the semi-final games as well the 5th - 8th place games in the right menu. Russia brushed aside Turkey during the second half of the game 41-14 to book their place for the fifth place match (63-41). Polina Fedorova was the leading player for Russia with 21 points and 11 rebounds, while for Turkey Basak Altunbey poured in 17 points. Italy will meet Russia in the fifth place match after a comfortable victory against low scoring Sweden (71-45). In a balanced Italian offensive effort Cecilia Zandalasini (13 rebounds) and Elisa Ercoli (10 rebounds) had 12 points each. Slovenia failed to score for the last eight minutes against Greece and were punished. Greece scored the last 12 points of the game to win (59-52) and will meet Portugal in the match for ninth place. Portugal beat the Czech Republic (70-67) in a highly entertaining match.